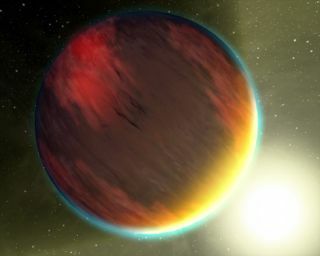 The basic chemistry for life has been detected in a second hot gas planet, HD 209458b, depicted in this artist's concept. HD 209458b, bigger than Jupiter, occupies a tight, 3.5-day orbit around a sun-like star about 150 light years away in the constellation Pegasus. The basic molecules required for life as we know it havebeen detected in a second hot gas planet beyond our solar system. The planet, which orbits a sun-like star about 150 light-yearsaway in the constellation Pegasus, is not habitable but it has the samechemistry that, if found around arocky planet in the future, could indicate a world that might support lifeor the presence of life. "It's the second planet outside our solar system inwhich water, methane and carbon dioxide have been found, which are potentiallyimportant for biological processes in habitable planets," said researcherMark Swain of NASA's Jet Propulsion Laboratory in Pasadena, Calif."Detecting organic compounds in two exoplanets now raises the possibilitythat it will become commonplace to find planets with molecules that may be tiedto life." The first planet in which organic molecules were detected wasHD 189733b, a hot, Jupiter-sized planet. The discovery was made by Swainand his colleagues in December 2008. Swain's team used data from two of NASA's orbiting GreatObservatories, the Hubble Space Telescope and Spitzer Space Telescope, to studyanother hot planet bigger than Jupiter, HD 209458b, and characterize it as thesecond knownexoplanet with organic signatures. The detections were made through spectroscopy, which splitslight into its components to reveal the distinctive spectral signatures ofdifferent chemicals. Data from Hubble's near-infrared camera and multi-objectspectrometer revealed the presence of the molecules, and data from Spitzer'sphotometer and infrared spectrometer measured their amounts. "This demonstrates that we can detect the moleculesthat matter for life processes," Swain said. Astronomers can now begin comparing the two planetaryatmospheres for differences and similarities. For example, the relative amountsof water and carbon dioxide in the two planets is similar, but HD 209458b showsa greater abundance of methane than HD 189733b. "The high methane abundance is telling ussomething," Swain said. "It could mean there was something specialabout the formation of this planet." Other large, hot Jupiter-type planets can be characterizedand compared in the same way. The techniques used are also similar for thosethat will be required to shortlist rocky Earth-like planets where thesignatures of organic chemicals might indicate the presence of life. Rocky worlds are expected to be found by NASA'sKepler mission, which launched earlier this year, but astronomers believewe are a decade or so away from being able to detect any chemical signs of lifeon such a body. If and when such Earth-like planets are found in the future,"the detection of organic compounds will not necessarily mean there's lifeon a planet, because there are other ways to generate such molecules,"Swain said. "If we detect organic chemicals on a rocky, Earth-like planet,we will want to understand enough about the planet to rule out non-lifeprocesses that could have led to those chemicals being there."